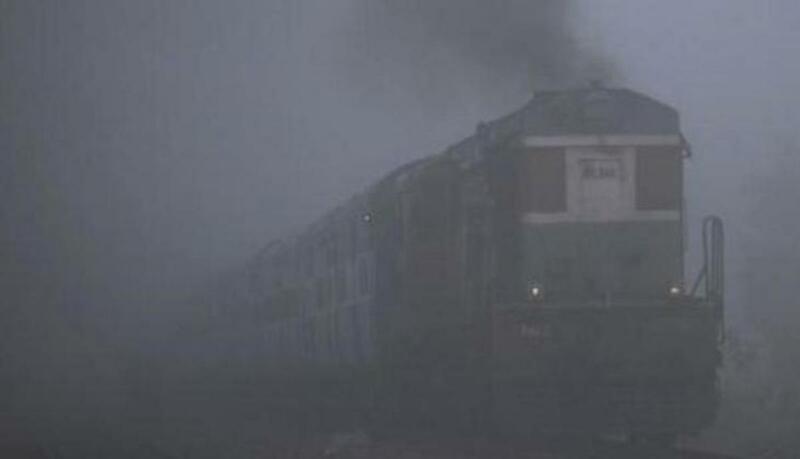 At least 11 Delhi-bound trains were running late on Friday as visibility in parts of northern India plummeted below 100 meters due to dense fog, which is predicted to engulf the national capital for the next three days, according to the MeT department. Dense to very dense fog is predicted for Delhi during the wee morning hours on Saturday, which is expected to further lower visibility in the region and bring down the temperatures, the Indian Meteorological Department (IMD) said Friday. East Madhya Pradesh, while moderate fog at a few places over north Rajasthan and at isolated places over East Uttar Pradesh and Bihar. Visibility in major cities are Punjab Amritsar lowered down to 25 meters; Madhya Pradesh's Satna to 50 meters," IMD in its daily weather forecast. The delayed trains are Sitamarhi-Anand Vihar Lichhavi Express, Malda-Delhi Farakka Express, Puri-New Delhi Purushottam Express, Gaya-New Delhi Mahabodhi Express, Dibrugarh-Delhi Brahmaputra Mail, Howrah-New Delhi Poorva Express, Bhagalpur-Anand Vihar Vikramshila Express, Islampur-New Delhi Magadh Express, Haldia-Anand Vihar Express, and Rewa-Anand Vihar Rew Express. After a short spell of "moderate" condition, overall air quality in Delhi again turned "very poor" with Air Quality Index (AQI) at 319. "AQI is expected to remain in very poor range for the next three days with a slight increase in magnitude," System of Air Quality and Weather Forecasting and Research (SAFAR) said. However, continuous wind and rain in the last few days contributed to bringing down the major pollutant particulate matter 10 (PM 10) concentration from "moderate" to "poor". On Friday, PM 10 and particulate matter 2.5 (PM 2.5) in the nation capital was detected at 158 and 93 respectively. Meanwhile, thick fog engulfs the city of Bihar's Gaya lowering down the visibility to 100 meters. Meteorological Centre, in its advisory, said that rain and thunderstorms accompanied with hail is very likely to occur at some places over Prayagraj, Hathras, Agra, Etah, Sant Ravidas Nagar districts and adjoining areas in Uttar Pradesh.